Quick question: how does your brand’s social presence stack up against your competition? Because if you’re looking at little more than followers and Likes as a measuring stick, you might be in the dark. The reality? While these surface-level metrics can be valuable, they don’t tell the full story of your social presence. Think about it. Comparing the Instagram activity of a small, local retailer to the likes of H&M or Old Navy would be apples and oranges. And so if you want to accurately measure your brand via social, you need to measure yourself against metrics that makes sense. That’s where your competitive benchmark strategy comes in. By conducting a competitive benchmark analysis, you can better understand your own strengths and how to stand apart from the crowd. And hey, that’s exactly why we’ve outlined eight benchmarks to keep an eye on. The more you dig into these data points, the more actionable insights you have toward beefing up your social presence. First thing’s first: marketers should have a strong pulse on what’s considered top-performing content in their space. When you have a post that explodes in “Likes” and shares, it’s a clear signal that you’re doing something right in the eyes of your audience. And similarly, you should know what your competitors are posting that’s scoring them the same sort of love. The good news? These numbers don’t have to be a secret. With the wealth of competitive analysis tools, you can quickly see what sort of content is killing it in your industry. 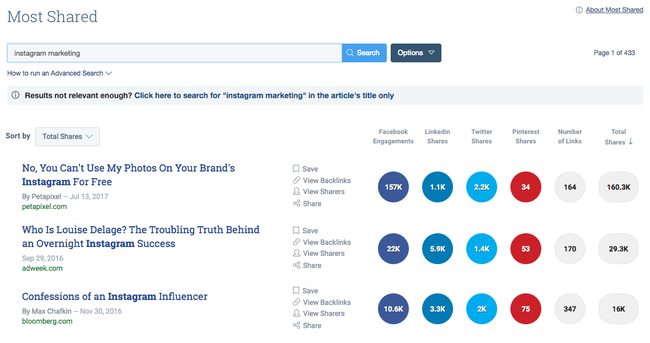 For example, with BuzzSumo you can see the most popular content in your niche broken down by keyword. 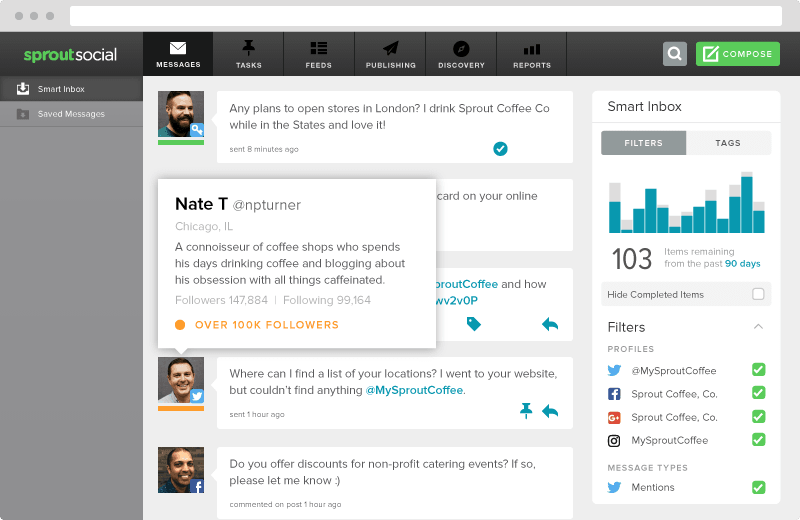 Meanwhile, Keyhole allows you to see the most liked and retweeted posts coming from a specific competitor you have in mind. Of course, none of this means much unless you know which sort of social content is working for you. 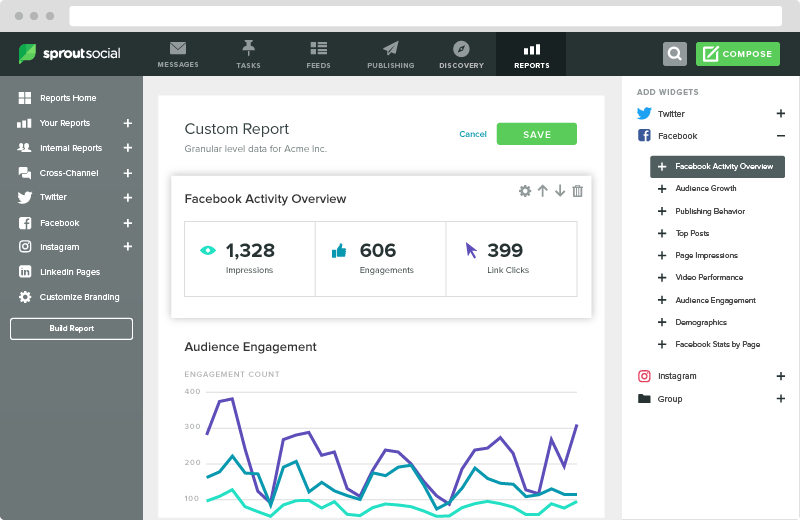 Analytics such as engagement reports in Sprout provide an in-depth breakdown on which of your pieces score the most traction. By analyzing impressions, engagements and clicks, brands have actionable insights on what they should be posting on a day-to-day basis. By weeding out underperforming posts and content, you can consistently fine-tune your posts’ performance over time. Timing is a critical competitive benchmark as brands try to maximize the number of eyeballs they get on any given piece of content. 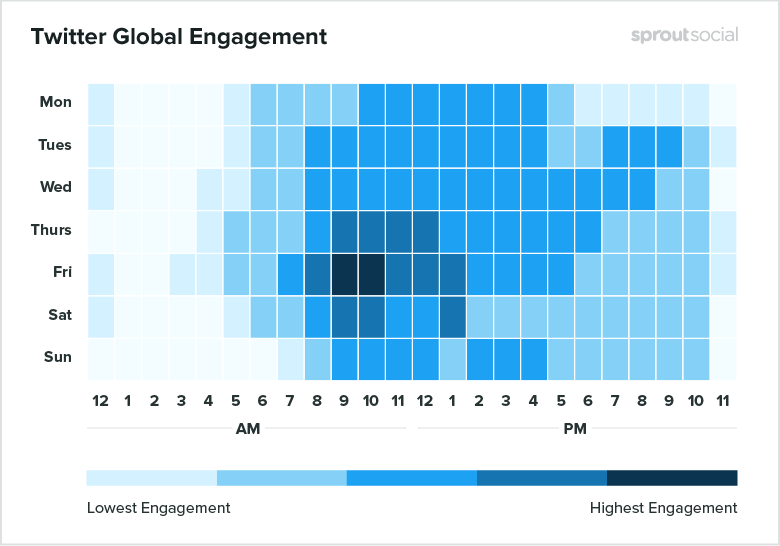 Based on Sprout’s own data, the best times to post on social media varies from platform to platform. Either way, if you aren’t publishing your posts when your audience is most active, you’re inevitably stifling the reach of your content. Likewise, you’re providing an opportunity for competitors to swoop in for your followers’ precious attention. 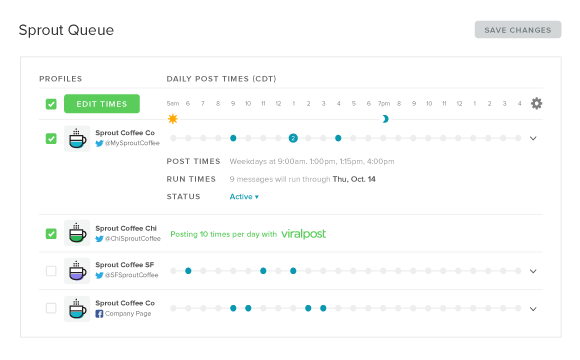 Tools such as Sprout’s own ViralPost feature removes the guesswork so that brands can queue up their content based on the followers’ behavior. Oh, and the ability to schedule in advance takes away the pressure and headache of having to exclusively post in real-time. Here’s some food for thought, though: brands should not only be aware of when they’re posting but also how often. For example, if your competitors are consistently posing on Facebook, Instagram and Twitter multiple times today and you’re not, there’s likely going to be a gulf of difference in terms of your social followings. As such, take some time to conduct a competitive audit that examines when, where and how often your competitors are posting. Doing so can clue you in on “dead” periods of time where nobody in your industry is posting, and likewise social channels they might be neglecting. This also helps you save time by posting only when it makes sense based on data. Rather than try to pump out as much content as possible, you should strive to make every post count whether it’s through captions, hashtags and, of course, scheduling. It can’t be said enough: your follower count isn’t the be-all, end-all of your social presence. As a competitive benchmark, your brand’s engagement rate is much more important. 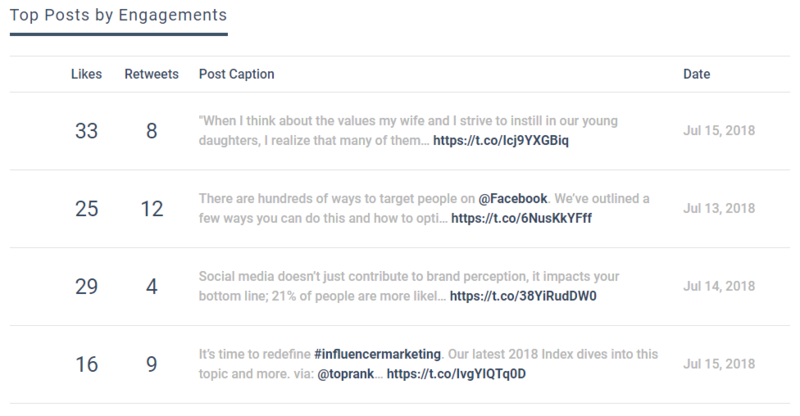 In short, engagement rate pits your follower count against how many likes, shares or comments that your social content scores. A brand with 1,000 engaged, active followers is much more valuable than a brand with 10,000 followers that sit on their hands. Whether it’s due to fake followers or lackluster content, there are brands that have seemingly massive “followings” on paper but low engagement rates. It’s also important to understand what constitutes a strong engagement rate in your area of business. 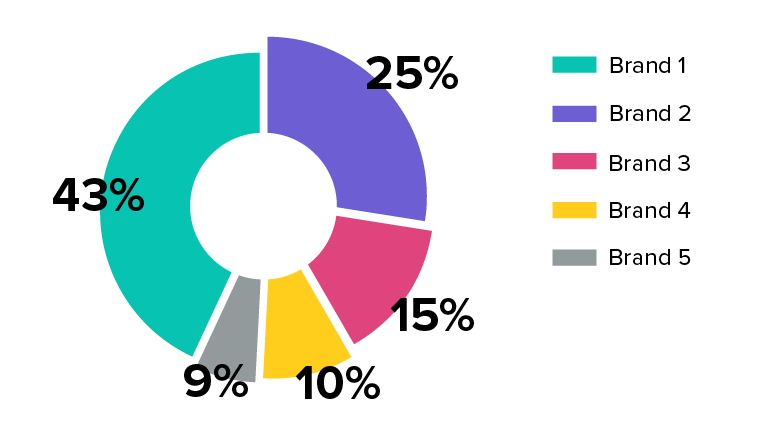 Here’s an example of an engagement rate analysis using Phlanx on Instagram. Denny’s is known for its rabid base of social followers and scores an awesome engagement rate in response. 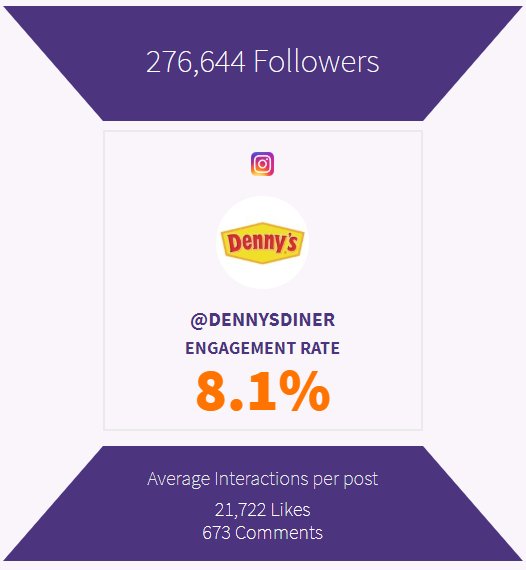 If your brand was a competitor to Denny’s in this case, you could look at this engagement rate as a target for high performance. Higher engagement means higher participation in your campaigns. This enthusiasm is much more likely to result in sales, brand advocates and a legitimate ROI for your efforts. Again, a massive follower count might look impressive but means little if it’s not producing results. For this reason, brands should dig into their competitors’ follower counts to see how frequently they actually engage. Reports such as Simply Measured‘s comparative engagement analysis can clue you in without having to crunch the numbers yourself. In pursuit of more engagement, brands should look at the types of content they publish as a key competitive benchmark. 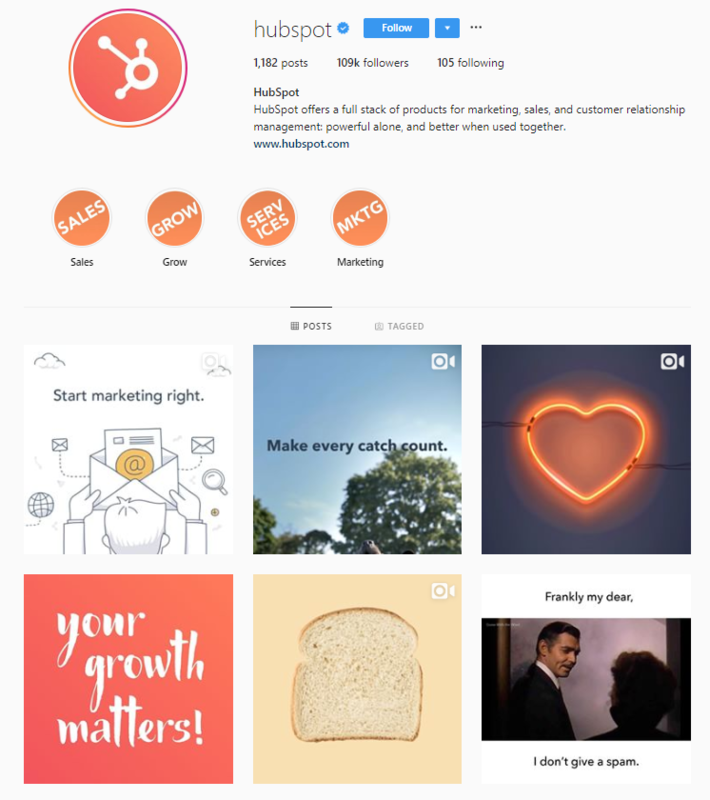 For example, Hubspot’s Instagram boasts everything from how-to education content and memes to motivational videos and beyond. The takeaway here is that competitive brands don’t just post the same type of content again and again and expect results. Similarly, you should have an idea of how your content strategy serves as a contrast to others in your space. As part of auditing your competition, try and see which types of content they might be neglecting. Regardless, there are so many social media ideas to ensure your content strategy doesn’t look identical to your competitors’. Conventional wisdom tells us that if you consistently post and engage with your social followers, your presence will grow. Publishing fresh content. Rolling out new campaigns. Going back-and-forth with fans. The list goes on and on. And while these are all great actions to take, brands should be aware of just how much their social following grows as a result. As a competitive benchmark, growth rate examines how much your following has grown versus raw numbers which don’t mean much by themselves. For example, while 1,000 followers in 6 months might seem like a flood to you, that might be a drop in the bucket to a big box brand (think: Starbucks, Target). 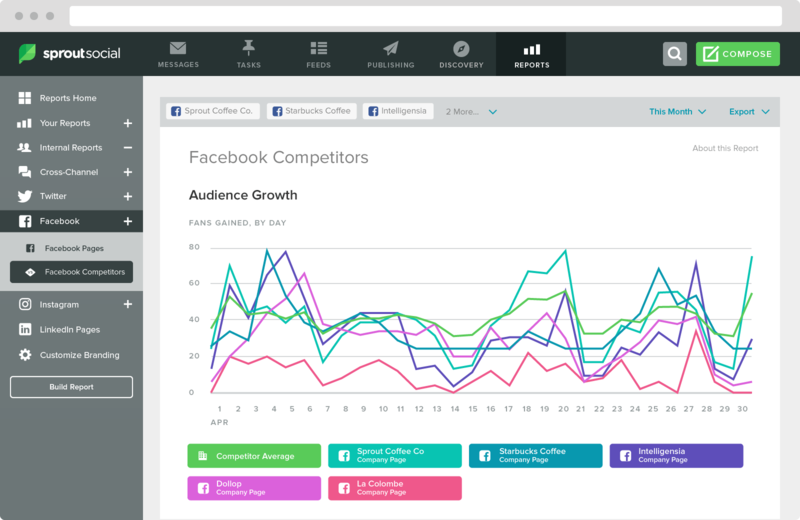 Reports such as Sprout’s audience growth analysis helps track your growth rate over time alongside your competition. This can help you see if certain campaigns were more effective than others, and likewise if your competitors did something that totally killed it. And hey, as long as your numbers are ticking upward you’re golden. Do you consider yourself to be a leader in your industry? An up-and-comer? Somewhere in-between? No matter what space you’re in, you’re likely jockeying for position among your competition. Share of voice is a competitive benchmark that measures just how much you’re being heard against similar brands via social. Boosting your share of voice ultimately involves contributing more to your industry’s conversation. This means posting thoughtful content, engaging with your audience and taking a stance on issues within your industry. For example, are you up on all of your industry hashtags? Are you sitting on the sidelines when it comes to controversy in your space or are you taking a stand? After all, you can’t expect much of a share of voice if your voice isn’t being heard. Yet on a related note, there’s more to social media than just being the loudest voice in the room. We live in a day and age where not all press is good press. Sentiment analysis as a competitive benchmark measures whether or not your brand mentions are positive, negative or neutral in the eyes of your audience. This metric is especially important if you’re laser-focused on customer care and interacting with your followers. Likewise, you want to make sure you’re seen as the proverbial “good guy” in your space when placed next to your competition. 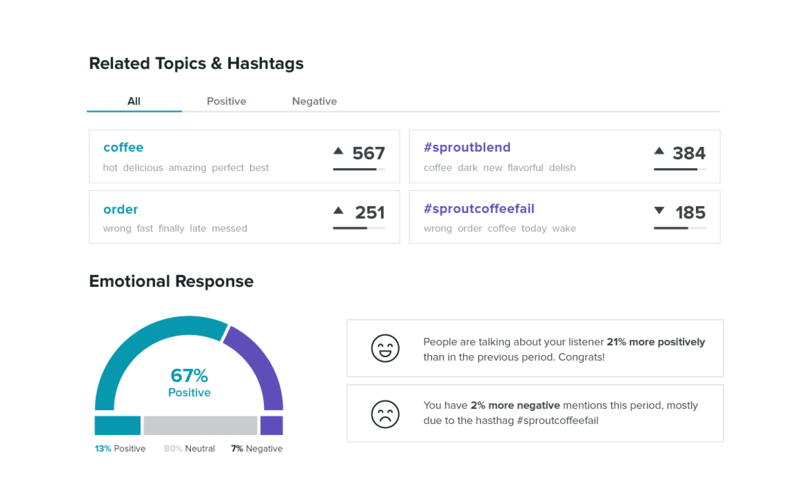 Sentiment analysis should most definitely be part of your social listening strategy to ensure that you capitalize on positive mentions and address negative ones. Scoring social mentions is the ultimate goal of any brand. We want that sweet, sweet engagement. We want those conversations and moments to sell ourselves. As a result, you need to know who’s talking about you and likewise who might be talking about your competitors. Again, this is why social listening is so important for tracking competitive benchmarks. Because after all, not all mentions are created equal. Scoring a shout-out from a major industry player or influencer serves as social proof for your brand. The ability to track, measure and respond to mentions in real-time also signals you as a more active participant in your industry. Which Competitive Benchmarks Are You Tracking? Listen: if you want to build the best social presence possible, you need to take a data-driven approach to growth. Conducting a competitive benchmark analysis is a game-changer for brands who’ve been focused on little more than follower count. If you’re hungry for a better ROI from social and want to know what to do next, these are the metrics that deserve your undivided attention. And hey, given the wealth of tools out there to help you track them, you can take action on your insights sooner rather than later. But we want to hear from you! How much do you research your competitors via social? Do you make a conscious effort to avoid copycatting your competition? Let us know in the comments below!